In addition, won't the ball axis tilt if there is any break/slope to the putt? I think I recall seeing this on the Aimpoint express video. Me and the guys I typically play with call them "practice rounds". For example, we would go to the course after work knowing that we probably aren't going to get 9 holes in before dark, but have no intention of playing for a score. Instead, we use it as a chance to work on our game, or maybe to test out a new driver shaft or different balls or something like that. We might hit several tee shots off the par 4s and par 5s, or hit a few approach shots into each green. Depending on what I'm working on, I might not even putt...just fix my ball marks, pick-up and head to the next tee. Basically it's similar to what the Tour guys do on Mon and Tues of a tournament. Hitting balls on the range is great, but hitting shots on the course is different, so it's something I do on a regular basis. What are your thoughts on this as it relates to posting scores for handicaps? There's nothing in the Handicap Manual that I've ever found that addressed practice on the course. 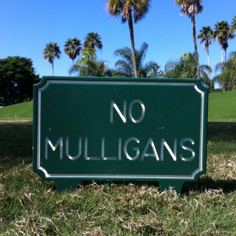 The rules simply require that you post scores that are played under the Rules of Golf. The problem comes with enforcement by the Handicap Committee. The Committee generally has to reconcile the records of who has played on which days against the scores posted by those players. The expectation is that if you went out to play, you should post a score. Consequently, it becomes a record-keeping issue to keep track of who is playing golf, who is playing alone, and who is practicing. Then there arises the issue of a player who ends up having a really good (or really bad) round and deciding partway through that its a "practice day" in order to avoid posting the score. 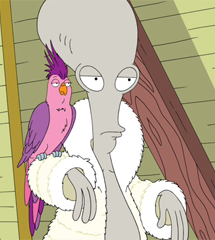 I have no problem with people practicing on the course like you describe, it just makes things more difficult on the handicap committee, and that's a pretty thankless job already. The line is on the ball is important to me. 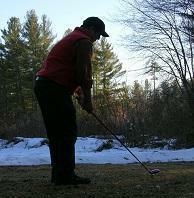 I aim it at a blade of grass, pitch mark or whatever i find that is on line with where i want to start the ball. I line up else everything off that. What @burr mentions is pretty unusual, but if it makes him enjoy the game more then have at it. Pay no attention to old @Groucho Valentine, he's a New Jersey curmudgeon. And just a little tip, when you want to mention someone by name, type the @ sign, followed by the first first letter of the name, and then pick the name from the list of members that pops up. That member will get a notification that you've mentioned them. And welcome to TheSandTrap! A couple of years ago, I casually mentioned to my instructor that I thought I was lipping out a lot of putts and he watched me line a couple from 15 feet and lipping them out (on a straight putt) and then told me: you're lining up the line at the edge of the hole, not inside it. Stop using the line and just put down the white part of the ball (no logo, no marking), pick a dimple to look at, and let your body/mind do all the alignment and other work to get the ball to the hole. 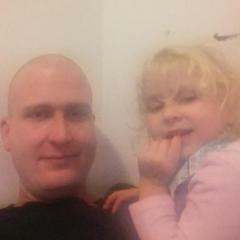 Results are much improved since then! TRUE - I once tried it. I drew lines on my ball and just to test my eyesight, I lay down behind the ball for a three footer and made sure the ball was perfectly in line. When I stood up and addressed the putt, lining up the line with the putt, it would appear that I was 8 inches to the left of the hole - and that was from three feet! It's amazing how the brain can adjust for what you see and what you think you see. I know this post is a month old @iacas, but I definitely agree with you. I draw a line, but mine is more for identification than anything, and it's probably not straight. I line up my putts to a spot a foot in front of the ball anyway. When I putt I place the ball so that I'm seeing nothing but white. No thanks to the line. Besides, how many putts are actually dead straight? Hit it too hard it goes above the hole....too easy and it rolls below the hole. In the case of a putt hit with improper force, the line is nearly unimportant. Reminds me of my buddy. He sets up with his feet pointing left of the line, then shoves the putt toward the line. I've told him what he's doing countless times, but he continues to do it. So.... he putts with an open stance? I do too, have done it for 20 years. Whatever works to roll the ball on the line you choose. We were talking about lining up an actual, physical line on the ball. Only thing is, he doesn't! And I don't know that a line on the ball would help him either. I don't use a line. All I want to see on a putt, or any other shot where I have the choice, is pure white! To me -- If you're concentrating on a ball ... don't ... you may get ball bound - I like my eyes either in front of the ball on the target line or another technique is on a short putt, eyes on back of ball, long putt - eyes ahead of ball. But not the top of the ball. Oversized grip? Depends on your grip on the putter. Superstroke, Golf Pride Tour Snsr, I've even used something called the Palmbird... whatever stabilizes your grip and allows you a tension free grip. Out of interest does anybody take advantage of being able to change balls between holes? e.g. switching to a 2 piece for a long,narrow hole, and 3 piece for the others? Nope, because I rather have consistency on my iron shots and around the green. I wouldn't find much difference off the driver on a 2-piece versus a 3-piece golf ball. 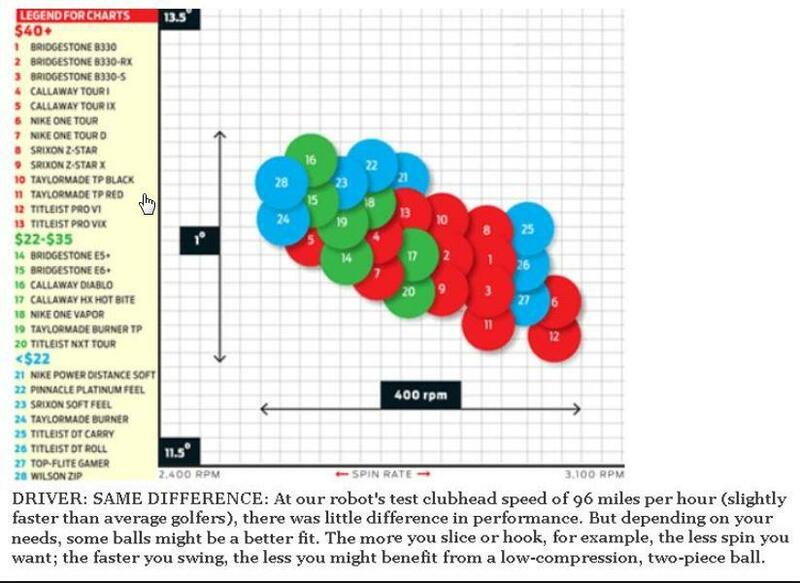 This was done by Golf Digest back in 2011, but it gives you a good look at how close most golf balls are when considering tee shots. When you consider wedge shots. 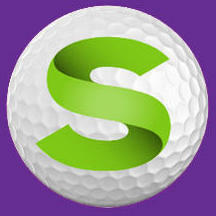 That is were premium golf balls excel over non-premium golf balls. I have one of those ball spinning gizmos, where once up to spinning speed, you touch it with a sharpie and it draws a line around the ball. I think it was a Christmas gift from a few decades ago. As I recall it was to help with finding the balance line of the ball, since back then, balls we're (allegedly) out of balance from the manufacturer. The second part being a help in lining up putts. I never really used that line for the Gizmo's advertised features. It was more of a novelty item. What I used the line for was identifying my ball (red stripe), and where I was contacting the ball on the club face. The red ink would transfer to club face. Then after the round, when thoroughly cleaning my clubs, I'd look at the strike marks. 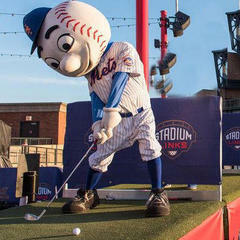 If they looked in the right spot of the club face, all was good with my swing, pretty much. If the marks showed movement starting one way, or another, I knew I was letting something I didn't need get into my swing.